UPDATE No. 2: Chick-fil-A spokesman says "fruitcake" remark was not a gay slur. UPDATE No. 1: A spokesman for Chick-fil-A said that the company is currently investigating the flier and will make a statement on the matter shortly. A Chick-fil-A franchise in the Atlanta area is passing out fliers for party trays that may be playing on the company's brush with LGBT rights activists. The company came under fire earlier this year after its president said that he was "guilty as charged" when it came to using his company to support antigay causes. 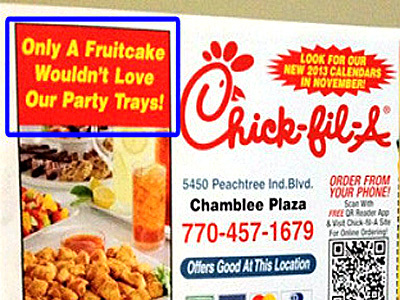 The Chamblee, Ga., store's advertisement, posted on Towleroad, claims, "Only a fruitcake wouldn't love our party trays." A manager at the store declined to comment, and a call to the corporate communications office has not yet been returned.